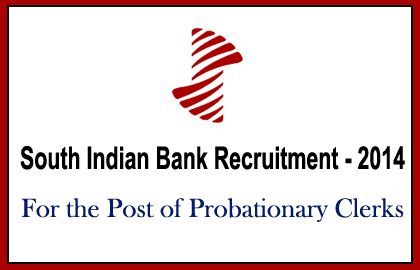 South Indian Bank has announced opening for the post Probationary Clerks. Eligible candidates can apply through online before 04/10/2014. More details about this recruitment were mentioned below. Graduation from recognized university with at least 55% marks in Science/Engineering streams or 50% in Arts/Commerce/other Streams. Not more than 26 years as on 31/07/2014. Candidates will be selected on the basis of the performance in the written exam and personal interview. Apply Mode: Eligible candidates can apply through online in the banks website:www.southindianbank.com from 24/09/2014 to 04/10/2014. Last date for receipt of application (system generated), With Demand Draft and other documents: 13/10/2014.